Lenora B. Fulani, Ph.D. – All Stars Project, Inc. Co-founder / All Stars Project, Inc.
Dr. Lenora Fulani graduated from Hofstra University with a major in psychology, and pursued graduate studies in the field at Columbia University’s Teachers College and the City University of New York, where she earned a Ph.D. in developmental psychology. 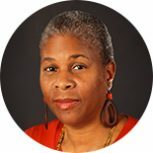 She worked as a guest researcher at Rockefeller University from 1973-1977, specializing in the interplay of social environment and learning, with a particular focus on the Black community. While she was at Rockefeller, she was introduced to the postmodern psychology movement and the work of Lois Holzman, Ph. D. and Fred Newman, Ph.D. In 1981, she co-founded the All Stars Project with Dr. Fred Newman. Over the years she has worked closely with corporate volunteers, CEOs and partners in Fortune 500 companies to build All Stars Project’s innovative programs, including the Development School for Youth, which she co-directed from 1997 to 2006. Dr. Fulani currently serves as the dean of UX, the All Stars’ unique institution of continued development which is free of cost and open to people of all ages and backgrounds. Dr. Fulani is the founder and director of Operation Conversation: Cops & Kids, a series of dialogues and performance-based workshops with police and inner-city youth to help them improve and develop their relationship. Since the program’s inception in 2006, 188 workshops have been conducted in the community involving 1,834 cops and 2,172 kids; additionally 5,929 Police Academy graduates and 3,048 community members have attended a total of ten Operation Conversation: Cops & Kids Demonstration Workshops. Dr. Fulani has long been active in creating change through political action. She has twice run for president as an independent. In l988 she became the first woman and first African American in U.S. history to appear as a presidential candidate on the ballot in all 50 states. In 1994 she co-founded the Committee for a Unified Independent Party, a national strategy center for independent voters, which currently has networks in more than 30 states. She is a founder of the Independence Party of New York State.